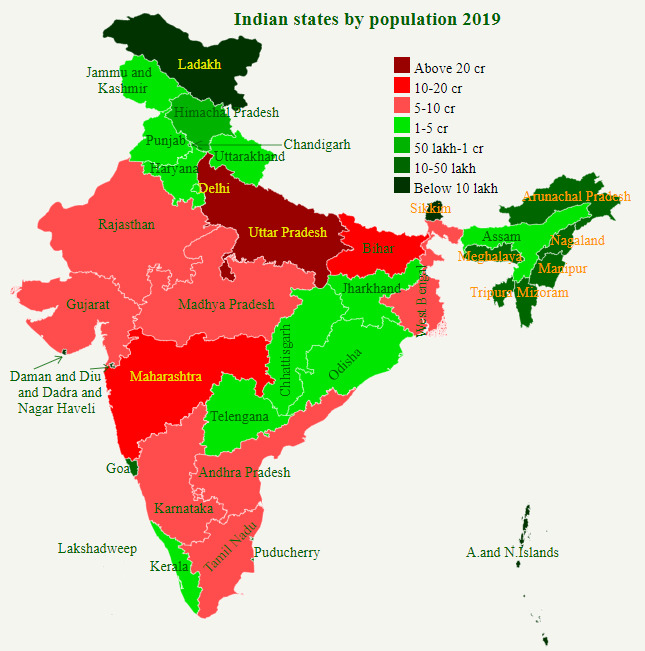 Uttar Pradesh is the most populous state of India with estimated population of 228,959,599 in 2018. which is more than the population of Brazil, the fifth most populous country in the world. Uttar Pradesh accounts for 17.15% of the total country population 1,335,140,907. Maharashtra is the second most populous state with more than 120 million people living here closely followed by Bihar is at third place. Population of Maharashtra and Bihar are slightly less than Japan. Three states have population more than 10 crore. Twenty states and one union territory (Delhi) have a population of over ten million. 48.63% of the country's population lives in five States, namely, Uttar Pradesh, Maharashtra, Bihar, West Bengal and Madhya Pradesh. Ten most populated states of India contributes 73.92% of India's population. Seven States has population more than 20th ranked country of the world. 16 states comes under top 50 countries. Sikkim (671,720) is smallest state and Lakshadweep (71,218) is smallest union territory of India. Bihar has highest growth during 2011-2018 of 14.76% followed by Uttar Pradesh and Rajasthan. Daman & Diu is only state/UTs having negative decadal growth rate of -9.52%. Top 5 states with highest sharing of rural population : Himachal Pradesh, Bihar, Assam, Odisha and Meghalaya. Top 5 states with highest sharing of urban population : Goa, Mizoram, Tamil Nadu, Kerala and Maharashtra.